Styling your home can be fun and easy for some, but it can also be a daunting and overwhelming experience for others. If you’re in the latter group, this handy guide will have you dropping jaws and fielding compliments at your next dinner soiree. Being a student can be tough. You’ve got to (try to) attend all your lectures, complete assignments (on time) and study (cram) for exams, while also juggling part-time work on your so-called ‘days off’ and maintain some form of a social life. Depending on your circumstances, you may be itching to move out of home, or you’ve recently taken the plunge and have already flown the coop. The longer you wait, the higher the chances are of finding a piece that works just perfectly. Among all the other stressful household issues that may arise after a recent move, interior styling might not be at the top of your priority list – and that’s okay, sugar. 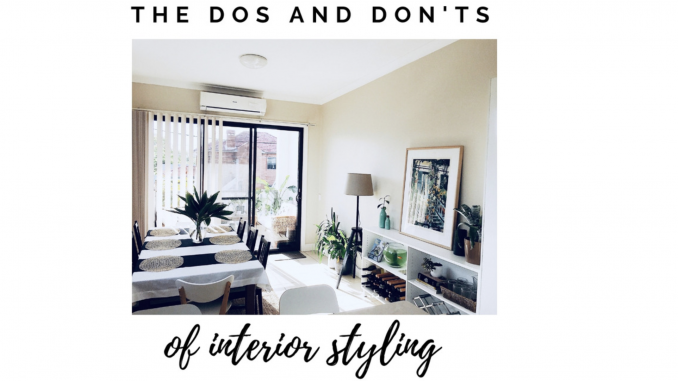 I’ve spent a bit of time over the years decorating (and making the odd regrettable faux pas) to feel confident in sharing my experience of the dos (and don’ts) of styling a home. Most of the ideas on this list are fund-friendly, so if you’re like me and are a bit financially challenged at the moment, don’t fear, I’ve got you. DO: Buy your bigger furniture items first. It may seem obvious, but heaps of people get overexcited when initially heading out to go furniture shopping and end up with a bunch of stuff that just flat-out doesn’t work with the space and could cause a stack of yucky clutter early on. Pick out two or three colours or shades that you like, and stop there. Start with your lounge, dining table or television cabinet and then add to the space according to what tones and colours you now have. Remember, you’ve got plenty of time to eventually fill every blank corner and empty wall and the longer you wait the higher the chances are of finding a piece that works just perfectly for you. For your basics, the classics like IKEA and Kmart will do but it’s important not to go overboard. Though these options are usually decently priced, they’re not built to last and will fall apart in time. Don’t forget to make a list of the op-shops in your city and make a day of thrift shopping – thank me later. DON’T: Leave the house without a tape measure and the specific measurements of the space you have available. Trust me, you won’t be bothered to return bigger items once they’ve already been taken out of the flat-packs and if they’re not quite right you will settle, but please don’t. DO: Pick a theme. Think neutrals! Pick out two or three colours or shades that you like and stop there. Is your space kind of dark? Find some lighter colours and fabrics to brighten it up. Light can be achieved in lots of different ways. Remember neutral doesn’t mean boring, start with the basics then add other colours in the form of greenery, pillows and artworks. DON’T: Mix the wrong colours. If you’re unsure which colours go together, a quick Google will help you figure out which combinations will work, and which ones will have your dining room looking like Showbag Hall of the Royal Easter Show. Of course, everyone’s tastes are different and you may enjoy some themes that others don’t. It’s a good idea to establish your colour boundaries before making purchases. Even if you have a black thumb, it's important to consider some funky flora. DO: Include greenery. Flowers and plants dramatically change the look and feel of every room, so even if you have a black thumb, if you want a hot looking home, it’s important to consider some funky flora. If you’ve got commitment issues and don’t want to risk bringing another living object into the house, then perhaps consider fakes. They’re not the same BUT you can get some extremely realistic looking ones from most homeware stores. Unfortunately, but not surprisingly, they’ll cost an arm and a leg. DON’T: Be too ambitious. When it comes to plants, even if you really dig the look of one, remember that they require maintenance. Start with your hardier shrubs such as snake plants, fiddle-leaf figs, Areca palms or succulents. These bad boys are super easy to look after, suited for the great indoors and will give your room a splash of colour and texture that’s hard to beat. There's nothing like seeing beautiful prints or striking photography when you walk into someone's home. Try sourcing your plants from the bigger nurseries in town, rather than boutique florists, because let me tell you the mark-up is shockingly high! Go to the source. If you know a florist, ask where their plants come from and go for a drive. Bunnings is also another good option. DO: Find some art or prints that reflect your own personal style. There’s nothing like seeing beautiful prints or striking photography when you walk into someone’s home. It gives you a huge insight into who they are and what might influence them. Adding art to your home will give your place a polished feel AND let your guests know how sophisticated you are. Just remember to measure the space first because proportion is key. DON’T: Rush into buying art. This should be one of the final stages of decorating a home and extra care should be taken when picking out art for your space. Remember, the longer you take to find your works of art, the more chance you have of finding something that really suits you and compliments your space. Nobody likes Target prints in the lounge (sorry Target). Check the video below for more! Journalism student with a passion for news reporting, international affairs and lifestyle writing. Awards Season: who will take home Golden Globes and Oscars?